SGIM provides you with the means to expand your knowledge and sharpen your skills, while exploring innovative approaches to your work. 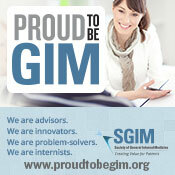 As you explore the many facets of being a member, you will find the programs and activities of SGIM to be innovative and a reflection of the shared interests and needs of its members. Skills Development Opportunities: Participate in one of SGIM or ACLGIM’s skills development programs and events: Academic Hospitalist Academy (AHA), Teaching Educators Across the Continuum of Healthcare (TEACH) Certificate, the Quality Improvement Skills for Reliable Care Course, the ACLGIM LEAD Certificate Program, and the ACLGIM UNified Leadership Training in Diversity Program (UNLTD). Training Directories: Access residency and fellowship program information that contains essential information to help prospective applicants evaluate and contact appropriate programs. To learn more about these and other opportunities, click here.